Courtesy of WOWSA, Huntington Beach. Michael Twigg-Smith grew up on Oahu and is an multi-talented waterman from Hawaii. 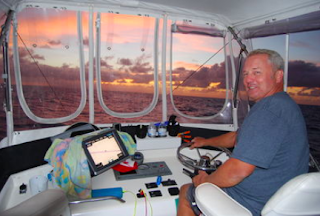 He played water polo, swam competitively, has paddled 6-man canoes for Waikiki Surf Club and Waikiki Beach Boys across the Molokai Channel 7 times between 1990 and 2002, surfs and windsurfs throughout the state, and is a member of Heartbeat sailing team of the Waikiki Yacht Club. Over the last several years, he has escorted soloists and relays 42 km across the Molokai Channel between the islands Oahu and Molokai. 1. The Veterans (a relay with Karen Schmidt, Amy Dantzler, Brent Blackman, Bill Ireland, Bruce Thomas, Dianne Gleason) from Molokai to Oahu in 9 hours 45 minutes. "Six swimmers to compete in the inaugural relay race across the Kaiwi Channel." 2. Richard W. Gaenzle, Jr., Brian Ross, Chris Kraus, a 3-man relay in 13 hours 45 minutes. "Three guys from New York." 3. Cameron Keith from Cairns, Australia in 13 hours 55 minutes. "The 15-year-old was youngest to swim the course. It was very calm conditions." 4. Rohan More from India in 17 hours 30 minutes "who came with his mom." 5. Boguslaw Ogrodnik from Poland "did not finish due to becoming seasick"
6. Stephen Junk from Australia "did not finish due to becoming seasick"
7. Brothers John Royer and Mark Royer from the USA "completed their relay in a rain squall in 14 hours 30 minutes"
8. Attila Manyoki from Hungary "set a new record time in 12 hours 2 minutes in the roughest conditions ever, but he had a favorable current at the end"
11. Daniel Curtis from the USA "cancelled his attempt due to extremely large surf in February"
12. Antonio Argüelles Díaz-González from Mexico completed his crossing in 23 hours 18 minutes. "We had to start at La'au Point because of big surf and the beach at Kaluakoi was gone, completely washed out, just rocks there. Whales came over to check out the swimmer, the current took us all the way to Hanauma Bay." 13. A 6-person Russian team led by Sergi "did not finish due to white tip sharks"
16. Jorge Crivilles Villanueva from Spain "started his swim at 5:44 am and finished at 11:38 am. His 17 hour 54 minute crossing was the first by a Spanish national. He took a very northerly course and finished at Alan Davis Beach. During the swim, he was approached by tiger sharks. When one got really close, he shook the Shark Shield at it and it swam away." 17. Dr. Thomas Hackett from the USA started at 6:34 pm and finished at 9:27 am. "His 14 hour 53 minute swim that finished at Alan Davis Beach was done under favorable conditions." 18. Stephen Junk from Australia started at 4:07 pm and finished at 5:57 am. "His 13 hour 50 minute crossing was his second attempt and he faced winds that were way stronger than predicted. It was very rough, but the waves were pushing us straight towards Oahu. We arrived at Alan Davis Beach while it was still dark and we had to continue to Sandy Beach where it was barely daybreak." 19. Beth French from Great Britain started her 17 hour 59 minute crossing at 3:05 pm and finished at 9:04 am. "She became the first female to complete the course two times. The currents and weather were very favorable; Stefan Stuckert and crew filmed the whole way where she finished at Alan Davis Beach." 20. Abhejali Berdonova from the Czech Republic started her 22 hour 8 minute crossing at 5:21 pm and finished at 3:13 pm. "She got pushed 1 nautical mile north for the first half, and north again on Makapu'u Ledge, finished at Sandy Beach. She became the first person from the Czech Republic to complete the course." 21. Cae Tolman started at 5:06 pm and "swam for 17 hours but did not finish. There was an incredible riptide was eddying us around and pushing us back towards Molokai. The first seven hours were great; he made it to the halfway point, but then the current pushed us back." 22. Pat Gallant-Charette from the USA started at 5:27 pm and finished at 5:21 pm for a 23 hour 54 minute crossing. 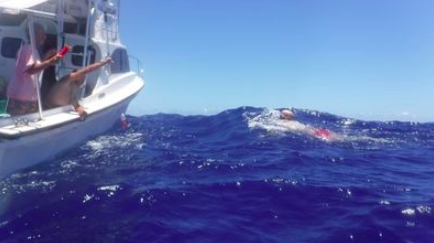 "At 66 years and 107 days old, she was the oldest person to complete the Molokai Channel. She fought a persistent current moving to the southwest for 18 hours and swam past pilot whales spouting rainbows." 23. Prabhat Koli, a 17-year-old from Mumbai, India "started at 6:08 pm and finished at 11:30 am for a 17 hour 22 minute crossing." 24 & 25. Nora Toledano and Mariel Hawley Davila from Mexico City "started their tandem swim at 6:15 pm and finished at 8:43 am for a 14 hour 28 minute crossing from Molokai to Oahu 1 day after a full moon with very light currents in very straight line." 26. Sergio Salomone from Argentina "did not finish despite a beautifully calm ride over to Molokai, but then as soon as night fell, the ocean became very very rough. The current pushed north throughout the swim before his brutal battle at the Makapu'u Ledge where he stopped 6 km from Makapuu Beach after swimming for 16 hours 25 minutes." 27. Matías Ola from Argentina "did not finish as the current pushed north as he swam for 17 hours before exiting the water."